The Waterpark College squad celebrate with the cup after their Subway All-Ireland Schools Cup U19 C Boys Final win over St Brendan’s Belmullet at the National Basketball Arena in Tallaght, Dublin. Photo by Piaras Ó Mídheach/Sportsfile. 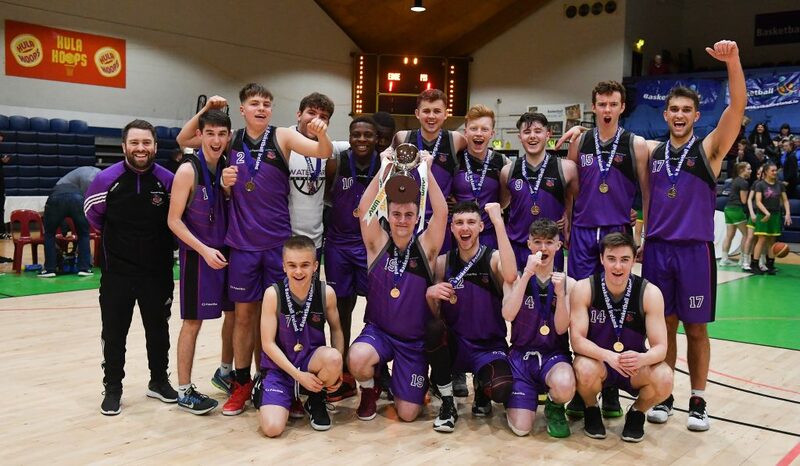 There were great scenes of joy at the National Basketball Arena in Tallaght on Wednesday last when Waterpark College held off a late rally from St. Brendan’s of Belmullet to be crowned the Subway Schools U19C Boys Cup champions. The Mayo side certainly made it a nervy finish for all involved, bringing the game back to within three points with just four minutes to play but in the end, MVP Mikolaj Sienicki and a superb display from Colm O’Reilly edged Waterpark back in front and they held on to see home a memorable win for the team. A hotly contested first quarter saw just one basket between the sides at the buzzer, as Evan Ivers, Dylan Walker and Luke O’Reilly dominated for St Brendan’s but were matched score-for-score by Waterpark’s Mikolaj Sienicki and Colm O’Reilly to see the Waterford side lead by two, 17-15. Waterpark hit their rhythm in the second quarter though and big scores from Sienicki and O’Reilly saw them stretch into a nine point lead by the midway mark. Belmullet were not lying down though and Sean Lavelle, Evan Ivers and Eoin McDonnell stepped up to the mark in style to close the gap back down, but a dagger three from Sienicki closed the quarter and edged Waterpark into a 34-26 half-time lead. The third quarter was just as fast-paced. St Brendan’s were out of the blocks extremely fast with scores raining in from Ivers, who slotted home seven points back-to-back. Two more baskets from Lavelle kept the Mayo team right in the mix, but again, it was Sienick and Colm O’Reilly who kept Waterpark’s noses in front, while James Delahunty began to dominate under the boards getting some huge stops on St Brendan’s to deny them further scores to see the Waterford school into a 52-43 point lead going into the last. The fourth quarter was heart stopping stuff as St Brendan’s again came out all guns blazing. With just over four minutes to go, scores from Aran Reilly, Lavelle and Ivers had the game back to a three-point game, 58-55. A timely time-out for Waterpark followed, and it was Waterpark’s Sean Ryan that settled his side down once more with a well-taken score which was followed by a super score from Mark Phelan and they were back in the driving seat once more and drove home to a 67-55 point win in the end. WATERPARK COLLEGE (WATERFORD): Sebastian Fialkiewicz, Sam O’Mahony, Daniel Johnson, Evan Gloeckner, Andrew Greene, Sean Ryan (4), Farouq Rabiu (2), Mark Phelan (8), Colm O’Reilly (20), Mikolaj Sienicki (29), Alex Power, Niall Purcell, Mícheál O’Sullivan, James Delahunty (4), Sam Mathe. ST BRENDAN’S BELMULLET (MAYO): Luke O’Reilly (5), Shane Togher, Dylan Walker (3), Eoin McDonnell (4), Aran Reilly (5), Ronan Barrett, Sean Lavelle (12), Evan Ivers (26), Padraig Monaghan, Leo Howard, Dara Lennon, Robert Barrett. MVP: Mikolaj Sienicki (Waterpark College).